The strange case of Shaun Ritchie: Fraserburgh lad missing for 2 years – WHERE IS THE OUTRAGE? Shaun Ritchie disappeared two years ago. RITCHIE has been missing for over a year and only his clothes have been found despite a far-reaching police search. THE father of a young man who disappeared a year ago today when a Halloween party went wrong believes his son was murdered. Shaun Ritchie was last seen running from a farmhouse near woodland outside Strichen, Aberdeenshire. Thousands of man-hours were spent combing the nearby area as detectives drafted in soil experts, psychological profilers, dogs, divers, ground-penetrating radar and helicopters in an effort to find the 20-year-old. Bogs, gorse, ponds and woods made the job of looking for Shaun difficult – and one police officer even broke his leg during the hunt. But it was all in vain. Speaking as the anniversary of his son’s disappearance approached, Shaun’s dad said he is convinced his boy met with menace on that fateful Halloween. Charlie Reid, 41, who lives near Fraserburgh, said: “He has definitely not walked out of there. Someone has taken him out of that area and he has been murdered – that’s what I believe. Charlie said the last time Shaun was seen he had been with a group who had travelled in a van to a remote farmhouse for a party. He added: “Something happened that led them to run and split up into two groups. Each group thought Shaun was with the other. “They all got home that night and he didn’t. Charlie said there is no way his son could still be alive, given the conditions on the night of his disappearance when temperatures dipped below zero. He added: “Some of Shaun’s clothing and belongings were discovered close to the farmhouse in a boggy area but that was the last evidence found of his movements that night. “The police have conducted one of the largest searches in Police Scotland’s history but, one year on, we are no closer to finding Shaun or to finding out the full events of that night. Charlie, who was working in Saudi Arabia when his son went missing, said as soon as he heard who Shaun had been with that night he was fearful, adding: “I knew it was bad straight away. Charlie said: “I have told the police time and again there’s no way Shaun walked out of the area where his shoes were found. He couldn’t have. “The police had ground-penetrating radar and they found stuff in the bogs, tiny little artefacts and loads of animal bones, but no trace of Shaun. Detective Chief Inspector Matt Mackay has led the inquiry into the disappearance since June. He admitted police have not ruled out foul play but said there was no evidence at the moment suggesting that Shaun had been attacked or murdered. DCI Mackay added: “All I would say is that we have left absolutely no stone unturned and that I will never ignore the prospect of criminality, but I have found no evidence to date to suggest Shaun has been the victim of any crime. “It is surprising in one respect we haven’t found Shaun, given the resources we have put into it. “It would be difficult to see how someone could get beyond that area. But we haven’t found him, so he could have gone beyond that. “We have no definitive evidential lines that we can follow that suggest he went somewhere completely different. Charlie said he accepts police had done everything they could in the search for his son. But he admitted he had struggled to get on with his life since Shaun’s disappearance. He said: “Each day of the last year has been among the hardest and most painful times that I have ever had to endure – and as each day passes that Shaun continues to be missing, things get no easier to live through. “I fully understand we will never see or speak to Shaun ever again and we will never be able to sit and listen to music and discuss who was the better vocalist in Black Sabbath – Ozzy or Dio. “It feels like I’ve been battered around the head by Mike Tyson. Charlie added: “I’ve three girls and my wife. I have to look after them as well and have a business to run and it’s hard to balance all that. “Shaun would be 21 years old now. I only really got to know him the last few years. “He was intelligent, funny and loved his music. “I had spoken to people in the oil industry and set up a job for him. “He’d been keeping his head down the last few weeks before he went missing. overseas and he was going to come over when I got home … but that never happened. ● Anyone with information about Shaun’s disappearance is asked to call Police Scotland on 101. A WORLD-renowned forensic expert yesterday said he believes detectives are privately treating Shaun Ritchie’s case as murder. Professor Dave Barclay, a forensic science lecturer at Robert Gordon University in Aberdeen, said police efforts had surpassed those in a normal missing person’s case. Barclay, who worked on the World’s End, Millie Dowler and Soham murder cases added: “The police seem to be treating it as a ‘no body murder’. “They may have some reason to think he has come to harm – that might be the background of someone who was associated with him at the time or it might be the running from the farmhouse. “It is quite unusual to successfully conceal a body where the likely area is known. “If you are looking to hide a body in that area, I guess the most likely place is somewhere under water and weighted down. The father of missing north-east man Shaun Ritchie believes he has been killed over a debt. Charles Reid was speaking on the two-year anniversary of his son’s disappearance as the senior officer investigating the disappearance of the north-east man has pledged the case will remain open. The 22-year-old from Fraserburgh was last seen in the Greenburn area near Strichen after a Halloween night out with friends in 2014. After he was reported missing, Police Scotland undertook one of the largest search operations in the history of Scottish policing. Despite this, he still remains missing, presumed dead. Charles Reid believes that detectives have failed to properly investigate the circumstances surrounding his son’s disappearance. He said the police have mishandled the situation, and although have tried to find out what happened to him, they have “failed miserably”. “It’s my opinion they have either been duped by the people involved or they have just missed something,” he said. Mr Reid added that his son was not a saint and that he knows Shaun owned some money. “I think he has been murdered, plain and simple,” the 42-year-old said. He added he hopes that one day they will find out the truth so they can lay their son to rest. Mum Carol Roy is convinced “foul play” was involved in his disappearance. She has repeatedly called on the police to consider the possibility her eldest son died as the result of criminal activity – a theory supported by a psychic medium who visited the search site. But now – as the second anniversary of her son’s disappearance approaches – Miss Roy has herself been charged by police. Shaun was 20 when he vanished in the Greenburn area, between Strichen and Fraserburgh. Despite a huge search, he remains missing, presumed dead. Medical experts believe he may have become disorientated in freezing conditions and stumbled into a bog. The search for the young man has been one of the largest missing person investigations in Scottish history. It was also revealed that two phone calls were made from the area to the police on the night of the incident – one calling for help and a second cancelling the request. His mum Carol Roy has long been convinced that foul play was involved in Shaun’s disappearance. A massive search was launched and five days later some of his clothing was discovered in the area — but Shaun has never been found. Two phone calls to cops were made from there on the night he vanished — one calling for help and another cancelling the request. Police are adamant there has never been any evidence of criminality. But Carol, from Aberdeenshire, Scotland, insists her son was killed and even called in a psychic to visit the search site who now supports her theory. (The psychic, Nikki Trott, 46, was also charged!! telecommunications offence here | here | here Nov 2015. Mr Ritchie’s father, Charlie Reid, enlisted the help of Glasgow group K9 Search and Recovery and its human remains detection dog, Barra at the weekend. However, the springer spaniel failed to find any trace of the 21-year-old from Fraserburgh, who was last seen at a farm near Strichen on a night out with friends on October 31 last year. Mr Ritchie’s parents have already joined police teams, family members and friends to conduct sweeps of the area where items of clothing – a belt, trainers and hooded top – were recovered in the days following his disappearance. Last night, Mr Reid, who has also offered a £5,000 reward for any information that leads to the recovery of his son, thanked the K9 team for giving up their time to help. Police launched a search for him, with a specialist diver, dog handling teams and the helicopter drafted in. Mountain rescue teams and the public also searched land near Strichen where he was last seen between the village and the A98 Fraserburgh to Banff road. His dad Charlie Reid, 40, said he had all but lost hope of finding his son alive. The new image, captured in Fraserburgh, shows Shaun on the afternoon of the day he was last seen. It shows him wearing dark grey skinny jeans, a white t-shirt, a grey hoodie and brown trainers. A forensic soil scientist and a geoscientist have been helping police in trying to find a man who went missing in October last year. The scientists used ground-penetrating radar and electro magnetics in their examination of the area where Mr Ritchie was last seen. They also studied soils and vegetation found on clothes and footwear worn by Mr Ritchie to try and identify places he visited. Prof Lorna Dawson, head of forensic soil science at the James Hutton Institute in Aberdeen, and Dr Alastair Ruffell, a forensic geoscientist in the School of Geography, Archaeology and Palaeoecology at Queen’s University, Belfast, carried out their investigations on 10 and 11 July. Police Scotland’s helicopter has also been making searches. Mr Ritchie was reported missing on 2 November having last been seen between Strichen and the A98 Fraserburgh to Banff road on 31 October. Det Ch Insp Matt Mackay, who is leading the inquiry, said: “Extensive police searches have covered over 21sq km and in addition 22km of ditches have also been searched, making this one of the biggest ever search operations carried out by Police Scotland, in what has been described as significantly challenging terrain. Prof Dawson said: “Material from the natural environment can transfer to objects or people through contact. For example, soil, vegetation and water can transfer onto clothing and footwear while a person is walking in an outdoor environment. HOLD ON A WEE MINUTE.. Soil Scientist & a Geo-thingy, ground penetration & magnetic-wotnots?! I mean this in the best possible way.. BUT, is anyone else getting the impression that they are goin to ahellavalot o trouble just for 1 person? & STILL they have nothing.. Couple things spring to mind..
Perhaps they should try lookin a few miles east? In my opinion, there is something far wrong wi this case. I think it STINKS & here’s a few MORE reasons why.. It was Halloween & he was in middle o a forest! No body, but shoes, hoodie & belt were found? Cops r saying “No evidence of criminality”. So where did he go without his shoes & it was October in Scotland! No hoodie on? Was he 2 hot?! Medical experts say they think he wandered off & got lost & froze 2 death. Possible. But that don’t explain y he woulda half stripped himself 1st!!! 2 phone calls. 1 requesting help, 1 retraction. There goes the idea he wandered off in a confused state. If he was compos mentis enough to retract call. WHY DID HE NOT HAVE HALF HIS CLOTHES ON? Or.. call no2 wasn’t him? (poss even both calls) either way the 2 calls are WELL dodgy. Shaun’s “friends” Were they the same age? & how did they get separated? WHY DID THEY LEAVE HIM 2 allegedly wander off, confused & half undressed? & then they musta drove off. Were they there wen the calls were made? Were they all drinking? *IF* they were all larking about & there was an accident, where is the body? blood? Why did they leave his clothes etc etc etc… But there is very little info about them, which in itself is strange. 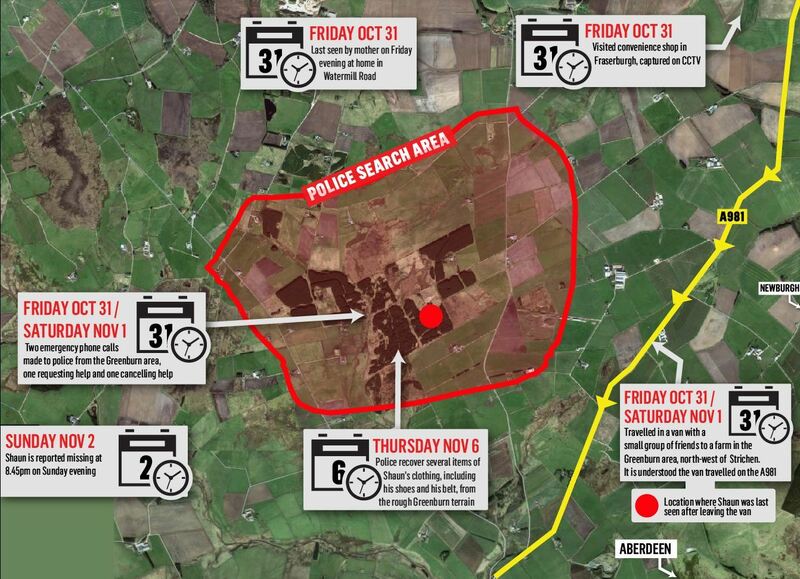 GeorgieCop BLATANTLY LIED “clothing have been found a distance from where he was last seen” BLOODY LIAR! Take a look at the map above. As 4 the rest o the tripe he spouts. What a crock… He is more o a hinderance than a help. Nuff said! WITHOUT cops, Dad hired a cadaver dog from Glasgow group K9 Search & Recovery. NOTHING. Apparently the dog worked really hard & was shattered by end o day so they musta covered a reasonable area. So if Shaun’s body wasn’t there, where did he go? or, where was he taken? Any excavations locally?!! Top maps are just so you can see that I am in the correct place! The farmhouse near where Shaun Ritchie was last seen has been put up for sale for £350,000. Tributes to the missing Fraserburgh man lie only yards from the front of the five-bedroom property where it is understood Shaun was last seen by friends. Hundreds of police officers, mountain rescue volunteers, marine divers and members of the public descended on the Greenburn area around the Kersiehill farmhouse in November. Items of clothing Shaun was wearing on the night of his disappearance were recovered from the scene. But despite one of the largest coordinated missing person’s investigations in Scottish history, there have not been any major developments since New Year. She never heard from her son again. The then 20-year-old, who had “no patience”, left his phone at home on the night he disappeared. “I phoned the police for a missing person. I didn’t want to believe it was true. But no – then he was a missing person. “I don’t care what Police Scotland have to say about whether there’s no suspicious circumstances or foul play.